Due to stress, sun exposure, genetics, or the natural stages of aging, men and women may experience skin laxity in the upper region of the face, around the forehead and eyes. Often times there is little to be done about a loss in skin laxity without requiring a full facelift procedure. Using his years of experience and knowledge of facial anatomy, Dr. Brown has helped many of his patients to attain a more youthful facial appearance through his brow lift procedure. To learn more, please contact our office today and request a consultation. 1 What is a Brow Lift? Whatever the name, these lines and wrinkles cause the face to appear even older than it may truly be, with heavy eyebrows and sagging skin. A brow lift (also known as a forehead lift) is the cosmetic procedure many people choose to reduce forehead wrinkles, raise the skin over the eyebrows, and shift the underlying muscles and tissues below the skin to regain structure and provide a more youthful aesthetic. There are several different main brow lift procedures to choose from to help accomplish your desired results. These are selected according to a patient’s specific goals, current state of their brow, health, and how much work will need to be done to achieve the desired results. The open brow lift also known as the coronal brow lift or coronal forehead lifts the traditional brow lift surgery and the method that most people know of. The incision is made within the hairline, in order to hide any scarring, and goes from ear to ear, allowing the surgeon to remove excess fat and tissues and reposition skin for smoother results. This method is one of the least invasive brow lift procedures, where the surgeon makes a number of tiny incisions within the natural hairline. The surgeon then uses a special camera and instruments to adjust the underlying muscles and tissue, while also removing small amounts of excess skin, to achieve a more youthful forehead appearance. A variation of the classic brow lift, this technique has smaller, shorter incisions on the temples, within the hairline. This allows the surgeon to remove excess skin and tissues, smooth out skin between the eyebrows to remove frown lines, and otherwise achieve similar results as with the coronal forehead lift. All candidates should make sure they are in good health and have no medical issues that could result in complications during surgery. Candidates should be non-smokers, or at least be able to stop smoking entirely well before the procedure takes place. Being physically active as well as having realistic expectations and goals is important to brow lift success. A consultation is required for all of Dr. Brown’s patients before undergoing a brow lift or forehead lift procedure. During this consultation, Dr. Brown will not only review your expectations and hopes for the brow lift but will also help you understand the surgery and recovery process from beginning to end. Be prepared to review your entire medical history, goals for the brow lift procedure, any health issues and current prescriptions, and other relevant information. Dr. Brown will evaluate your health and determine any potential risk factors. You will review all possible options for the surgery and discuss the best route, measure your facial features, take “before” photos, and go over possible outcomes and complications. Write down any questions you might have and bring them to the consultation. Dr. Brown will do everything possible to soothe any anxiety (which is natural to feel before such a procedure), and keep a positive outlook going into your brow lift. Dr. Brown will have brow lift patients stop smoking (if they currently are) about three weeks before the scheduled surgery, as well as reduce or eliminate any prescription medications that could cause health complications about two weeks prior. If you are uncertain whether any nutritional supplements you are taking might be an issue, be sure to bring it up during your consultation. You may also be asked to undergo lab testing, and should also avoid all anti-inflammatory medication, such as aspirin or Tylenol, as these increase the risk of bleeding and bruising. 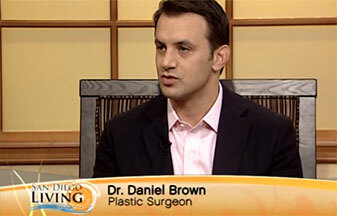 There are four main steps to the forehead lift procedure that Dr. Brown follows. Each will be reviewed in detail during the consultation and may be adjusted depending on the patient’s specific needs, but the main process is as follows. Employ Anesthesia — Depending on your needs or comfort levels, Dr. Brown will suggest either intravenous anesthesia or general anesthesia. Local anesthesia supplemented by mild sedation is the most common approach. Make Incisions — Depending on the chosen method—whether it’s an open brow lift, an endoscopic forehead lift, or a limited inclusion brow lift—the surgeon then creates incisions behind the hairline to hide any scarring. Adjust Tissue — Using specialized instruments and/or cameras, the surgeon goes below the skin, adjusts muscle and tissue, removes excess fat, and eliminates extra skin until the desired results are achieved. Close Incisions — Once finished, the surgeon lifts the remaining skin and closes the incisions with removable or absorbable sutures, adhesives, or medical clips. All of this takes place within 1-2 hours, depending on the complexity of the procedure and the individual patient. Recovery from a brow lift surgery is usually rather swift. In fact, most patients are sent home with the advice to walk around at a gentle place. Within 1-2 days, the patient can start showering again, with special care being taken around the incision areas. Some patients can return to work within one week and can resume general activities within 10-14 days in most cases. Dr. Brown will continue to check up on you during this time to ensure no complications have arisen. Normal side effects of a brow lift include facial swelling, bruising, headaches, and other mild symptoms that should be no cause for alarm. Most patients experience little-to-no pain after the procedure, and this can easily be managed with medication prescribed by your surgeon. Brow lift results should be immediately visible. The swelling and cuts will fade over time, while the brow region will continue to improve as it heals, and be fully rejuvenated within a few months. Forehead lifts can create smoother, firmer skin for many years. While aging is inevitable and wrinkles and lines will return, certain lifestyle choices can encourage your skin to remain more youthful longer. This includes the reduction or elimination of smoking or heavy drinking, maintaining a healthy diet and physical activity, and apply sunscreen daily. On average, an endoscopic brow lift will deliver results that last from 5-7 years, while a coronal brow lift can maintain results up to 10 years. Again, results will vary from patient to patient. Botox: An injection of a neurotoxin temporarily paralyzes the forehead muscles, causing a smoother appearance to the skin. Done properly, this can last for up to 3-4 months but must be repeated to maintain the results. Dermal Fillers: Synthetic or natural products are injected beneath the skin, inducing the production of collagen in the facial region. This causes a fuller, firmer, and softer look for the skin. Eyelid Surgery: Rather than having surgery on the entire face or forehead, sagging eyelids can be the focus of the procedure. With a blepharoplasty, Dr. Brown can remove excess skin that is creating the look of droopy eyelids and take years off of your appearance. When you choose to have a brow lift, you might also consider having one of these additional treatments performed at the same time. This reduces the look of an aged appearance, and because the procedures are done simultaneously, the skin will continue to age in concert with itself. The cost of a brow lift is going to vary widely depending on the extent of the work being done, the surgical facilities, etc. Dr. Brown will gladly review all cost factors with you during your consultation, so you are fully aware of the details of your brow lift. To obtain a custom brow lift quote, please contact our office and schedule a one-on-one consultation with Dr. Brown.